Enjoyable if over-baked Hong Kong action film, which is essentially a drawn-out contrivance to have Tony Jaa and Jacky Wu fighting together in the same film. It takes its sweet time to get there, although we are spoiled early on with a completely inconceivable bust-up between the two action heroes in an interrogation room. Jaa’s ‘no wires’ motif seems to have been omitted from his contract (again) as the occasional wire fu moment brings the film out of its moody, contemporary crime setting and into the realms of uncanny valley. Much of the action is played out over a huge classical score, and is saved from being too pretentious by the sterling efforts of both leads. Jaa, making his Hong Kong film debut, plays a straight-laced warden at a Thai jail who finds the only person capable of helping his sick daughter with a bone marrow transplant. That person (surprise, surprise) is none other than tough undercover HK cop Jacky Wu, who through no logical reason finds himself hauled up in the very same jail as Jaa. Both Jaa and especially Jacky Wu get to flex their dramatic muscles with sensitive back stories – Jaa as the doting single father to a dying child, and Jacky Wu as a struggling cocaine addict – and this is where the two provide some of their best acting. It’s a shame more can’t be said for the villains in the story. Louis Koo plays the ailing head of an organ trafficking syndicate who, in a clunky ironic twist, desperately needs his brother’s heart to save his own life. It is never quite determined where this subplot fits into the central drama, and without a strong adversary for the final reel, Max Zhang steps in as a supply villain to take on Jaa and Jacky in the final round. It’s a suitably meaty conclusion, but there are at least two other superbly orchestrated showdowns. One is a super tense shoot out at a HK ferry terminal, and the other is a ‘one take’ brawl which – although we have seen this done a million times now (see Kingsman, The Raid 2, and even Jaa’s Warrior King) – it is still an achievement. 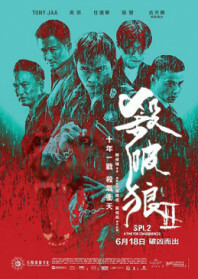 The film also has nothing to do with Wilson Yip’s 2005 hit SPL, starring Donnie Yen and Sammo Hung, other than the thematic link of undercover cops and the presence of Jacky Wu, who famously made a name for himself as one of Sammo’s heavies. AKA: Kill Zone 2; Lethal Warrior; SPL II.